UNO Cages Racks for rodent cages. 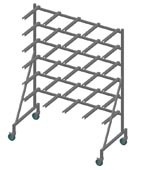 Cage racks are available in many sizes, types and for all cage types. Download the PDf file on our cageracks here! → two of the four castors are equipped with brakes. → with and without integrated drinking water supply. 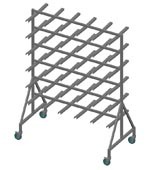 → s.s. cage rack, allowing placement of different sizes cages per level in just one rack. Configuration to be determined by you. → Available in stainless steel or aluminum. 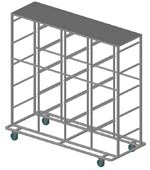 Code Please, contact us for more information on the possibilities of the UNO Shelving System. Custom made racks are available on request!